Volume 6, Issue 3 (2012) Pp. 1–17. Professor Frederick Louis Otto Roehrig, a distinguished philologist, linguist, and polyglot, traveled broadly in North America doing research on languages from several families. His research in the Pacific Northwest resulted in vocabulary lists from several Salish languages. Because the collected data often represent several dialects of the same language, they allow us to see some details about a language at the time of early contact. For example, Roehrig’s lists are useful for the study of variation and change within the Central Salish language, Halkomelem. The multi-talented Frederick Louis Otto Roehrig ca. 1865. Acting Assistant Surgeon, U.S. Army. Dr. Roehrig is identified by a caption below the image that states: "DR. F. L. OTTO ROEHRIG/ Special Eye and Ear-Surgeon, in the service if the United States Army." This specialist designation has not been seen given to any other Civil War surgeon. 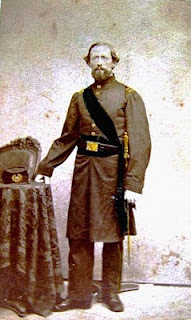 Roehrig is shown full pose in uniform with a tinted-green sash worn across the chest indicating that he is the ‘officer of the day.’ A Model 1840 Medical Staff sword is attached to his belt and his kepi is on a side table. http://antiquescientifica.com/archive7.htm.